The ultimate research proven post training recovery drink. 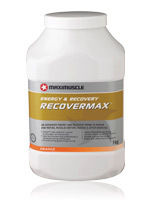 Maximuscle’s Recovermax® is possibly the most effective rehydration and recovery drink available. Its unique ratio of carbohydrate and protein helps restore body glycogen levels. Using Recovermax in conjuction with your regular training could bring you great benefits, including increased muscle power, increased work output and reduced muscle fatigue. It contains Biomax™ whey protein to provide ultra-fast delivery of all the essential amino acids after training. 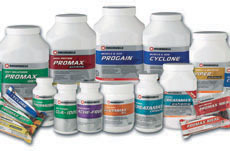 These are needed to repair damaged muscle after exercise and for muscle growth. Each gram of Biomax contains 20% BCAAs, more than meat, fish or egg. To keep up your energy stores, Maximuscle’s Recovermax will keep your muscles ‘ready for action’ as its unique formulation also helps prevent muscle damage after training. It contains the most potent collection of high dosage performance nutrients ever seen in a recovery drink. If you’re a runner, cyclist, rugby player, triathlete, weight trainer, boxer, footballer, swimmer or even in the military, taking this formula post exercise will really make a difference. It’s easy to digest and tastes fantastic. Pre-Workout Boost: Take 1.75 level scoops (50g) of Maximuscle Recovermax and mix with 400-500ml of water preferably in a Maximuscle shaker. Consume around 30 minutes before training / event for maximum stamina, energy, as well as for recovery afterwards. After Training: Take 2.75 scoops (75g) of Recovermax mixed with 400-500ml of water, immediately after training (within 15-30 minutes maximum) for optimum recovery. Throughout the day: If you’re on the go and don’t have time to eat regular meals, you can use Recovermax as a convenient meal replacement drink. This ensures you get a constant supply of high quality nutrition throughout the day to boost performance during work, rest and training. Add a serving of Recovermax to a clean and dry Maximuscle shaker, and place in your work or gym bag. Then add water when you need a quality nutrition or recovery drink.